Tuesday T(h)inkering — Ramsey Running from the Right. Righteous or Wrong(ish)? Where should our Welsh Warrior play and how do we get the best from him? Aaron Ramsey may have just about the most copied hair and beard combo in all of English football, but that does not stop him from being a controversial figure at Arsenal. Ramsey’s earliest contributions to the Arsenal appeared very promising indeed until the brutal injury he suffered at Stoke City on 27 February 2010. It ended his play for that season and that calendar year. In fact, Ramsey didn’t play again with the Arsenal first team until well over a year later and then only in cameos. Loan spells at Nottingham Forest and with his youth club, Cardiff City, helped him regain a measure of fitness and confidence. Simply put, however, the Ryan Shawcross tackle which shattered his tibia and fibula took at least one and a half seasons away from Rambo’s promising rise. When he did return to action, Ramsey became a lightning rod for supporter dissatisfaction with Arsenal’s squad at the time. The summer of 2011, after all, saw the dismantling of our team via the twin losses of Cesc Fabregas to Barcelona and the departure of Samir Nasri to Manchester City. An August home loss to Liverpool and that famous nadir, the 8-2 loss at Old Trafford, led to some deadline day spending (notably the purchase of veterans and future captains, Mikel Arteta and Per Mertesacker, among others) but not (nearly) enough to mask the holes created by the high profile departures. Basically, there were huge gaps at the center of Arsenal’s creative midfield play and Ramsey, just recovering from the big injury, was thrust into them. Talk about a tough spot for a guy at 21 years of age and one who had lost a year and a half to the major injury. Arsenal were able to steady the ship that season and get up for 4th place and more Champions League football. Still, Ramsey’s leggy running, his tendency to take a touch but then need 3 or 4 more to get the ball (somewhat) under control and his obvious lack of full fitness and confidence to replicate Cesc’s command of our midfield or Nasri’s threat nearer to goal was a real come-down for many supporters. Support for Ramsey almost became a proxy for supporters’ ambitions for the club. “He works hard but he’s a squad player (at best) and we need to buy a real #10,” was the main cry. That summer, we bought Santi Cazorla, the following brought Mesut Ozil, and the one after that, Alexis Sanchez. Despite these high profile arrivals–and continued criticism–Ramsey never complained nor shied away from his own attempts to help the club. Plagued, at least somewhat, with recurring soft tissue leg injuries, Aaron Ramsey has given what he could to the club. His best season was 2013-14. Despite having fewer appearances for the club (only 34) he returned 16 goals that year. But goals are not the only element in Ramsey’s game. Neither are assists, and compared to traditional #10s he does have a selfish streak and will take a punt from distance. Who can forget the volley last Autumn in Istanbul at Galatasaray? I remember one at Norwich from a tough angle and this one, versus Liverpool, shows what happens when focus (selfishness?) and technique come together. Against Manchester United, however, the Ramsey moment which stands out will be the miss that might have made it 4-nil. With David De Gea reduced to watching, Ramsey volleyed over the top left corner when a ball guided into the bottom right might have been the better choice. At 3-nil it wasn’t a killer, but still enough for some fans to lament his lack of goals to date this season. What do we need from our man? Is it goals? Assists? Maybe it’s a link between the back and the front? If we want any of these things, it seems ironic that Ramsey is being asked to do it all from a position on the right. Playing ahead of a youngster, Hector Bellerin, who is quietly becoming one of the best right backs in England, Ramsey often drifts into central positions and even, on occasion, pops up on the left. Is he being irresponsible or is this by design? My hunch is it is the latter and that Ramsey’s most incredible gift–a work rate that makes him just as effective and dangerous in the 90th minute as in the first–has been tapped by his manager, Arsene Wenger. “Run, Rambo, run,” knowing that Bellerin behind can do likewise, I believe, is the mantra here. 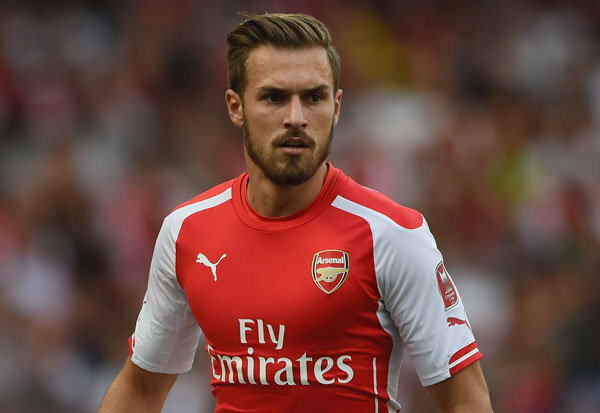 Ramsey’s movement is at the heart of all that is impressive about this current Arsenal team. Moreover, it’s a big factor in getting all our other attackers–notably Ozil, Alexis and our strikers–doing the same. This may offend those who worry about our defending from the front and ‘positional’ responsibilities, but, with Bellerin’s pace and the dedicated presence of Francis Coquelin at the rear of our midfield, I feel good about giving Ramsey the freedom to roam. He can step back and help out or he can be the link man (or a critical turn and go sort) as we try to strike on the counter. He needs to keep an eye out for another guy who also is committed to deeper postions, the incredible Santi Cazorla. Even as small as he is, Santi’s combination of exquisite close control, the ability to sneak in and steal the ball and the incredible range of longer passes at his disposal, mean others need to be ready to help–in one direction or the other–as the ball comes into and (ideally) makes its way back out of our half. Ramsey, in a free role from the right, is just that guy. His willingness to do just that also serves as inspiration for Alexis to do likewise from the left or Ozil and the strikers to have similar thoughts from more central and forward positions. In fact, if Alex Oxlade-Chamberlain could take a page from Rambo’s all action running (and thinking) and marry it to his own prodigious skills (on the ball) he might well challenge Ramsey for that spot on the right or work well with him on those occasions when Ramsey is handed a more central role. What say other Gooners? How do you rate our Welshman and what do you think of his role on the right? 22 Responses to Tuesday T(h)inkering — Ramsey Running from the Right. Righteous or Wrong(ish)? Well having just drawn stumps on this point with TA on this topic, I am not going to enter another one. I said my piece. Done. On the plus note for Ramsey, the technical data says Ramsey has performed the most sprints in the league this season … Go Ramsey, Go. You have captured most, if not all, of what is special about Rambo. For me it is his completeness, without being an absolute master at anything in particular. Aaron is the cement between the bricks and his running is key in all of this. He links midfield to attack and vice versa as he makes himself available and knows how to keep it simple. Like Ozil, he makes clever runs into space and reads the game well. He is an outlet AND a threat going forward. His forward passing is good but not great, but it does not have to be great. We have others for that; what is key is that he also carries the thread of a great pass, so he adds another dimension to our attacking play. He also makes great runs into the box and sooner or later he will start to put his chances away again. But it is not all about putting these away, as his runs also make space for others, which is just as key. Since then he’s been imo, one of our key players, but I’m not sure about being played on the right of midfield. The fact that he just gets on with it, is a testament to his maturity and professionalism. Also, when it comes to in form, vs out of form players and just how upbeat (or grim) we should ‘feel’ (or think…) about our prospects… Well, I think we probably need to look deeper with ALL the attackers. Alexis does look brighter these days (in South America too…) but is that because he was tired or mentally off on holiday or is it because he’s starting to catch onto all the little things his (club) teammates can do for him? In other words, while some of the Would-Be-Wengers are drawing up their starting 11s (including guys I KNOW they haven’t actually watched, some of whom are just learning to shave…) it’s really more about the group WORKING together to win matches. It doesn’t always come off–sometimes spectacularly so–but if you have guys who can shake it off and get back to the work element, good things can happen. This is a reason that Rambo continues to impress me more and more as time goes by. His work-rate may be a bit of a gift, but that ability to shrug off the criticism shows me something steelier. Sure, if he does a flick or two and scores a belter or three, the “who wouldn’t mind playing in Barcelona” quotes will be dug up and Arsenal fans prone to be jealous of handsome fellows (Piers Morgan, for example…) will pounce on his every error. Good thing he’s past that crap and (I expect) will keep his head on straight to try to do even more for his club… Likewise, even if he fluffs another few chances I don’t expect him to stop making those runs into the box. Memo …………Never listen to the little boy inside you !. For me, Rambo is only good at pulling defenders with him, creating spaces for his teammates to exploit and score. However, this season he has turned somewhat headless, running around as all other teams have seen through his tricks. That is why i might sound like Gerry, but i prefer Rambo to be the man in the final third, the target man to hold the defenders off, rather than just running around headlessly. Shall we say put him in the Central area just behind the striker and rotate the striking positions between Alexis, Theo and Ozil? Rejoice. Rambo has scored in Wales’ final international group match. So while everyone has scored in the front positions, hope they carry on the momentum? Most of the time Rambo gets lost in his runs, that’s why i mentioned headless. And also to your question of his goal, we should rejoice as all our attacking positions scored in the internationals, meaning goals will soon flow for us too :D..
And yes i was trying to do a Gerry by writing him off, but after he scored I am trying to be more diplomatic and wish that he gets better in his game. Good post HT. Also very clever. The discussion will kill many prejudices that are based on an issue not thoroughly considered. I see Rambo as very useful to the team. Somebody always there to dot all the aiz and cross all the tees. Inspite of his usefulness now, I see him as still developing. He has got it all already, he only needs to get simpler. Don’t use the energy required to lift a bucket of water to lift a cup of tea. The apparent diminished late runs into the box might actually be a progress. It may mean that he is getting territorially more responsible i.e. becoming more of a team player. His indomitable spirit is priceless and I can’t just stop seeing him in the context of tomorrow. Well done JK – I ignored all of HT’s attempts to get me to add more, but you have ticked the one box I was not expecting … speaking for me. The above one is a falsity too far. I have not ‘written off’ Ramsey. Far from it, I want Aaron Ramsey at his best, which I believe is lurking just below the surface. As for position, I think he is best coming from deeper, not as a No 10 attacking midfielder. That, even by the ‘Hoddle’ definition, is too far forward, imo. Hoddle’s alternative to the above No 10 is one of a second striker. From deeper, Ramsey can make runs to either wing. My problem with him on the wide right is, if, or when he drifts to the far left, unless whoever moves into space he has left has a similar inclination to defend, that is an awful lot of ground for Bellerin to cover. This is particularly true if it is Alexis has moved across as he tends to be looking for passes in the inside-right position facing goal. That comes back to the point about it being a team game. I don’t think we have mastered the positional side of things that will work against all comers. When you have both Ozil and Ramsey in ‘free roles’ it can leave gaps that will be exploited by teams with the necessary qualities. In the Man U game, as TA pointed out, clearly Ramsey played a more disciplined role on the right. It was no coincidence I think that Man U effectively played two wingers down that side, no doubt to try and exploit Bellerin’s isolation. The advanced role of Schwiensteiger, as G. Neville pointed out in commentary, certainly helped, as it left their pair matched up one-on-one. Note, for the record, I made a point of praising Ramsey in this game for his efforts.The only criticism I had, and was because we know how good he can be, was that of his attempts on goal. Interesting the goal he scored for Wales came in game where the team were all relaxed because the had already qualified. It remains to be seen if that unlocks his mindset v Watford? That remains my only criticism. His inability to recapture his control after any sort of break. And no HT, I don’t think you can go back to the Shawcross game as the reason, given the stellar season he had since then. What I do accept is that it is very difficult to ‘consciously’ to pick up top form. It has to come from an inner belief in his ability, and be able to use it without thinking. This is the difference between him and Alexis, imo. Alexis never lost his belief during his dry spell, it was just a mental sharpness that was lacking. That then is my non-input to this debate. Haha. Yes. I managed to get you clarifying yourself on the Rambo case. Now Rambo has started to score, we will see him scoring more. Ox has started scoring last weekend, so good news for the club ahead. More headache for the boss as both his main strikers are scoring. By the way, Alexis has tormented Brazil last week and has won his country’s match against Peru. That was why i mentioned rejoice as it seems good for our players at the moment. Yes he was headless before the manu** match. There were times he just ran around and putting passes off target. Think the start of the season. But as the Arsenal lads do, they seem to grow with the season. So, here concludes my discussion on Rambo. Ah.. TA, my mind just had an idea.. we have to do something like why does our season get reset to zero every time? True that a good end gave us fourth place the last few seasons before last year, which we finished third. All had bad starts and a fantastic second half. Rambo is Mustard! Would prefer to see him central as he lacks a bit of pace but he gives his all every game and his long range shooting reminds me of Rosicky. He is absaloute quality and a long term player for Arsenal. Sure to become a legend! wow a very well written post HT and a great read (especially in length) to have with my morning cuppa, unfortunately as you might have guessed i don’t really agree with a lot of it but hey that’s not really the point, it was an extremely persuasive point of view expressed expertly. for me this opinion of Ramsey is simply an over hyped rose tinted malaise left over from his one influential season at Arsenal. The lad has shown promise (most notably during that pre-mentioned season) for late runs into the box and a good finish to follow but this quality seems almost symbiotic to the style of game that Giroud dictates for the team when played up top with his hold up play and clever flick on’s to on running midfielders. Take Giroud out of the equation and make the game more about clever midfield play and balls through to forwards running beyond defenders and Ramsey’s technical ability is highlighted for what it really is – average. But this opinion of mine (and a few others) i feel has lead you to believe he is undervalued and this is not the case (well by me anyway) and as i wrote recently he is pinnacle in helping to provide the new sense of balance between work rate and flair at Arsenal that i for one believe will see us go further than in the past. I have always wanted a James Milner type hard working utility player in the team to bolster the flair of the others with hard work and dependability and Arsenal have provided us one with just as much energy and an even higher level of technical ability – perfect. I don’t see why we can’t leave it at that and instead feel it necessary to hype the guy up into some consistently high scoring midfield technical prodigy that is simply out of form for 99% of the time. Giroud plays – Ramsey instead of Cazorla next to Coq will equal more goals from late runs. Walcott plays – Cazorla instead of Ramsey next to Coq will equal more midfield magic and balls through for goals. F11, your comment is very well balanced. Don’t crucify him, don’t make a war hero out of him. Yes, Ramsey for Carzola will produce more goals as you said ….. but sadly at both ends!